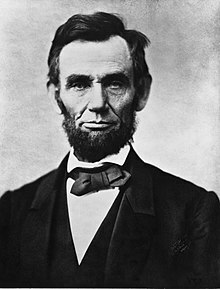 Abraham Lincoln, född 1809, död 1865, var amerikansk president mellan 1861 och 1865. "Om du är fast besluten så har du redan hunnit halvägs." ...all persons held as slaves within any State or designated part of a State, the people whereof shall then be in rebellion against the United States, shall be then, thenceforward, and forever free; and the Executive Government of the United States, including the military and naval authority thereof, will recognize and maintain the freedom of such persons, and will do no act or acts to repress such persons, or any of them, in any efforts they may make for their actual freedom. Four score and seven years ago our fathers brought forth on this continent, a new nation, conceived in Liberty, and dedicated to the proposition that all men are created equal. Now we are engaged in a great civil war, testing whether that nation or any nation so conceived and so dedicated, can long endure. Sidan redigerades senast den 25 november 2018 kl. 15.37.